HOTTEST Wednesday nights in town - the "Havana Nights". The new Havana Martini Club is located on 5th Street, between Race and Vine Streets. Meeting to kick off 2007, giving NSHMBA members an opportunity to get to know each other and network, as well as learn more about the 2007 goals and objectives. If you are not NSHMBA member, but would like to learn more about this organization, you're also invited. Just register at NSHMBA Website (click here). 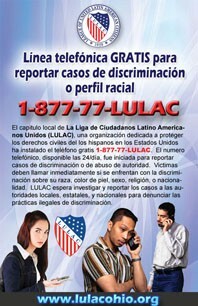 This year LULAC is giving away 5 scholarships. The first three are the LNESC scholarships for local Tri-State students which are handled through the Cincinnati council of LULAC. Two are for $1,000 and one for $800. There is no GPA requirements for the LNESC scholarships because they are below $1,000. Since the deadline is April 30th, 2007, please fill this one out ASAP and send to: LULAC Cincinnati, 1431 Walnut St. Cincinnati, OH 45202. The two others are the LULAC GM ($2,000) and LULAC GE ($5,000) scholarships - deadline for both: July 15, 2007. There is no greater cause to champion than providing a well-rounded, culturally diverse education to every child in Cincinnati. Since April 2003, Children’s Day, “El Día de los Niños” has celebrated diversity in Cincinnati Public Schools. This year’s festivities will take place from April 27th through April the 30th and all schools in the Cincinnati Area are invited to participate. The English Language Learning Foundation, Inc. is proud to be hosting the fifth annual Children’s Day, “El Día de los Niños” Celebration at the Cincinnati Zoo on Saturday, April 28th. While the festivities will span 4 days, we are expecting the highest number of participants during the event at the Cincinnati Zoo on Saturday. An estimated 600 children, along with their families and distinguished guests such as Cincinnati’s Mayor Mark Mallory are expected to participate on this day. This year’s theme is "We Are All Neighbors." With our main activity, "Passport to the Neighborhood," we will give each child a “passport” to be stamped at the stations represented by ethnic groups in Cincinnati including the following: African American, Appalachian, Chinese, Ethiopian, German, Greek, Guatemalan, Indian, Irish, Korean, Mexican, Peruvian, Senegalese. Hispanic Chamber Cincinnati USA had its monthly meeting this Tuesday, March 27). The Speaker was Mr. Larry Morgan - Sr. VP, Chief Procurement Officer, US Bank, who was speaking on "Establishing realistic expectations between buyers and sellers". The food was sponsored by La Verdad Marketing & Media. Another great Salsa night @ Mad Frog, with people enjoying the awesome dance floor and Non-Smoking room! In a recent meeting with LULAC leaders commemorating the 78th anniversary of the League of United Latin American Citizens (LULAC) in Washington, D.C., former President Bill Clinton was advocating greater economic and financial education of Latinos in order to reduce dependancy on so-called "payday loans" and other access-to-cash programs, such as rapid tax refunds, that may cost Latinos interests ranging from 40 percent to 500 percent. "The solution is preparing a budget, expanding access to alternatives," Mr. Clinton said. "I understand why this is happening. People need immediate access (to funds) for (financial) emergencies." He asked for LULAC's help in educating the community about budgeting and other economic issues. Mr. Clinton was recognized by LULAC with a "Presidential Award" during the group's 10th annual National Legislative Award gala. The award is presented to those who "defend and promote" the Hispanic community in the United States. Come and win 1996 Z-28 Cavalier donated by Oaxaca Motors de Fairfield!!! A Raffle with only 120 tickets @ $25 each!!! Edward James Olmos, Actor and Community activist, will be giving a speech at Wright State University (Student Union, Multipurpose Room) on Thursday, April 12th, 2007 7:00 PM - 9:00 PM. This event is free and open to the general public. It is sponsored by: Wright State University and Wright-Patterson Air Force Base. An Emmy and Golden Globe-winning and Academy Award-nominated Mexican-American actor is best known for his roles of Admiral William Adama in the 2003 re-imaging of Battlestar Galactica, Lt. Martin Castillo in Miami Vice, and Jaime Escalante in Stand and Deliver. Olmos has often become involved in social issues, especially those affecting the Hispanic-American community in the United States. In 1998 Olmos founded Latino Public Broadcasting and currently serves as its Chairman. The Latino Public Broadcasting funds programming for public television which focuses on issues affecting Hispanic-Americans and advocates for diverse perspectives in public television. Also, in 1998, Olmos starred in the uplifting and Latino movie The Wonderful Ice Cream Suit, that breaks stereotypes and transcends the normal stigmas of most Latino oriented movies. Olmos also makes frequent appearances at juvenile halls and detention centers to speak to teenagers at risk. He has also been an international ambassador for UNICEF. In 2001, he was arrested and spent 20 days in prison for taking part in the Navy-Vieques protests against United States Navy target practice bombings of the island of Vieques, Puerto Rico. The telephone number, available 24/day, was launched this month to compile complaints of discrimination and/or racial profiling. Victims are encouraged to call whenever they’ve encountered discrimination on the basis of their race, color, gender, religion, or nationality. It is LULAC’s hope to investigate and report these cases to local, state, and national authorities for further investigation and possible prosecution of those committing discrimination. In January 2007, MidwestLatino representative Rob Rice traveled to Peru on a search for salsa talent. He reports his findings in an article (click here). Sasha Rionda is "Dancing for the Stars"
Oscar Torres, screenwriter of the movie “Voces Inocentes (Innocent Voices)”, will speak at Xavier University on Wednesday, March 28 at 7:00 p.m. in Kelley Auditorium located in Alter Hall on the University campus. There will be a viewing of the film followed by a lecture by Torres and a question and answer session. This event is free and open to the public. “Voces Inocentes” portrays the writer’s life during the civil war in El Salvador in the 1980’s and the issues surrounding children soldiers. It recounts the story of a young boy who has a 12th birthday coming up. At age 12, he is eligible to be a child solider. The boy and his mother fight to keep him out of the war. The Student Activities Council, Lecture Series, Voices of Solidarity and the Intercultural Programming Funding Board are sponsoring this event. As a Catholic, Jesuit University Xavier University is dedicated to the pursuit of knowledge and to the orderly discussion of issues confronting society. On Thursday, March 22nd, NKU (Northern Kentucky University) hosted meetings between NKU President Jim Votruba and NKU personnel and representatives from the following universities: Universidad Autónoma de Zacatecas (Zacatecas, Mexico), Universidad Jesuita (Guadalajara, Mexico), and University of North Texas (Denton, Texas). The universities signed agreements about collaboration, incl. student exchange. Congratulations to Gloria Rodriguez-Milord who's been selected by the National Association of Social Workers to receive the Regional Community Award as Social Worker of the Year. This is the first time a Latina receive this award. Gloria will receive the Regional Award on April 24 at 5:30 PM at the Alumni Center at Univ. of Cincinnati. Gloria has worked with children and families for over 20 years. She is a native of Panama and is currently the Coordinator of Therapeutic Foster Care at Beech Acres in Cincinnati. She was a founding member and the past President of the Board of Directors of Su Casa Hispanic Ministry Center, the past President of the Adoption Awareness Alliance, and an advisory board member of the Council of Latino Executives of the Child Welfare League of America. Gloria serves on several other boards and committees.